In the 60s, people built their own houses in Gongguan, Taipei in order to survive, and in a time when financial and material resources were lacking, Treasure Hill, a village where people settled in to have their everyday needs met, emerged. Originally, this settlement embodied people’s anticipations for a life lived blissfully, and the landscape that surfaced was wild and primal; it was where life grew organically, and where people worked hard to survive. The breathtaking wild view at Treasure Hill represents the most realistic, pure, and primal strive for a better life, and because of people’s appreciation for beautiful cultural heritage, vision for a landscape enriched with culture, a sense of care for tenure rights of land and human rights, and trust in fairness and justice, many fervent acts of protest for safekeeping and preservation have taken place here on the Treasure Hill. 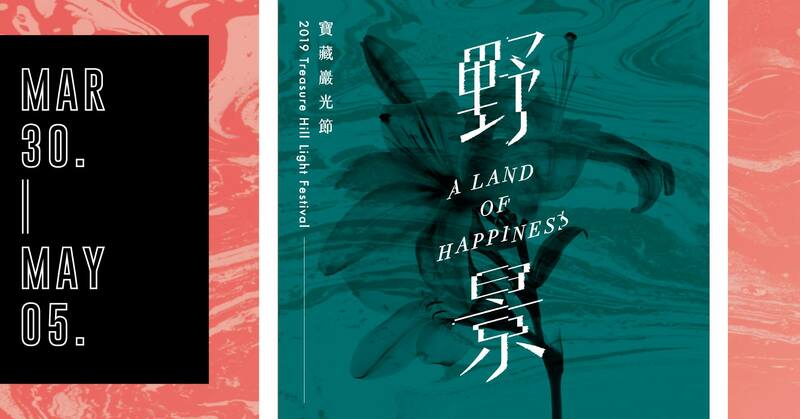 Artists have created speckles of light for the 2019 Treasure Hill Light Festival on this fascinating wild landscape, and extending from these glimmers are imaginations that juxtapose with the paradoxes found in modern society's civil and primal qualities. Upon entering into the village, I search in the crowd for a hundred, a thousand times by artist collective Yanyen takes people on a stroll through the village, carefully pointing out the lampposts scattered throughout the settlement and the view unfolding along with each step. With industrial development came bustling city life, with natural views slowly replaced. A full moon is projected by Hsiao Sheng-Chien inside a house on Treasure Hill, and the rather low-tech approach allows the artwork to echo with nature’s singing insects and birds. The artworks by Legacy Lab International and Olga Diego are also prompted by concerns for our natural environment, which have resulted in an artificial landscape with a cascading neon waterfall using plastic objects and items gathered from recyclable waste, and a plastic playground with an inflatable electronic installation with glittering lights. Erected on the Pagoda Plaza is The Wannian Station, a broadcasting system stage modified by Li Cheng-Liang from a spherical water tank. People are invited to climb on top of the artwork, as if they were climbing atop a space station parked on the rooftop, where they could sing or dream and fantasize. Projected on the sheet metal house on the side is Lose Contact-Night, where Kuo I-Chen explores mankind’s estranged relationship. A dialogue is formed with the state of detachment in modern life explored in The Wannian Station by Li, and the air-raid shelter in the back seems to have transformed into a wormhole that leads to a mysterious base in the great cosmos. Real emotions have become more ambiguous with the advent of artificial intelligence. Applying face tracking and on-line game in their creations, Chen Yun-Ju and Kentaro Taki present their interpretations of what is happening in contemporary society with people being abducted by technology. Situated in Treasure Hill’s innermost section is Iridescent Tree: Fruit Planet by Hsu Tang-Wei. The two peculiar planets in the artwork are primal and full of vitality, as they gaze out and connect with the large transparent tent that Michiyoshi Isozaki has set up at the entrance of the settlement, and inside of one of the houses in the village, Chuang Chih-Heng created traces of light memorizing the life story of local inhabitants. In this vivid and splendid landscape is a surge of life that is entwined with destiny’s ferociousness, as it continues to grow, instinctively. As time and society progress, emotions, concerns, and realities move forward through ironic syncopations. As the primitive and the civil coexist, the meaning of this land is intermingled and shaped, and contained in this rich wild landscape - a land of happiness is the anticipation we hold for life.